The Ethnobotanical Collection from the Libyan territories of the botanist Alessandro Trotter is included in the Oratio Comes Botanical Museum at the Faculty of Agraria at the University Federico II in Naples. Trotter explored different territories of Libya, mainly Tripolitania, between 1912-1924, collecting plant specimens and the drugs most frequently sold in the markets. The Libyan herbarium currently includes over 2300 sheets of mounted and accessioned plants. The drugs, mostly acquired by Trotter from Tripolitanian markets, were identified and packed in 87 paper sheets or boxes. Trotter added ethnobotanical information for each species when available. A database of the herbarium species and the drugs has been carried out, after a taxonomic update. Nomenclature has been revised according to the African flowering plants database and the World Checklist of selected plant families, and a comparison with currently available ethnopharmacological data from North African has been attempted. In this study, ethnopharmacological data related to about 80 species of flowering plants and to 4 lichens are presented. The plants are mainly from Mediterranean or Sub-Saharan habitats and belong to 37 different families; Lamiaceae was the most cited family, with 10 accessions. Generally, the aerial parts of the plants are the most frequently used (28 species), followed by leaves (15 species), flowers and seeds (9 species), fruits (7 species) and hypogean organs (roots, rhizomes, tubers: 5 species). Plants were generally processed in very simple ways: infusion or decoction of the plants were prepared and orally administered or used for topical applications. A wide range of conditions was treated, ranging from mental disorders to skin affections. All the organs of human body are considered, but the pathologies of gastro-intestinal tract, respiratory system and those related to traumatic accidents were the most frequently mentioned. The comparison with the recent ethnopharmacological research in Maghreb and its neighboring countries reveals a high correspondence; almost all the plants cited by Trotter are still used in the folk medicine of at least one of the North African countries, and the therapeutic uses of each plant appear consistent over time. The information collected by Trotter is an important contribution to tracing plant utilization in Libyan folk medicine over the last century. The Orazio Comes Botanical Museum at the Facoltà di Agraria dell'Università Federico II di Napoli encompasses the Historical Library, the Herbarium Porticense (PORUN), the Mycological Herbarium (POR) and wood collections (Xilotomoteque and Xiloteque). These wide-ranging collections were created in the course of the 19th and 20th Centuries and were kept in different sections of the Faculty of Agraria. Only recently was the Polo Museale delle Scienze Agrarie instituted, with the aim of unifying all the collections under a common structure. While the definitive building is under re-construction, the collections of the O. Comes Museum have been temporarily transferred to a provisional site. This on-going reorganization provided an opportunity for a careful examination of the items from each collection, including the archives, which document the work of various botanists from the early 1600s to 1940 [1–3]. One of the most interesting results of this work was the rediscovering of the Botanical Collection from the Libyan territories of the botanist Alessandro Trotter (Figure 1). A. Trotter was born on 1874 in Udine, Italy. In 1899, he graduated with a degree in Botany from the University of Padua, under Professor A. Saccardo, who accepted him as his assistant immediately after his graduation. 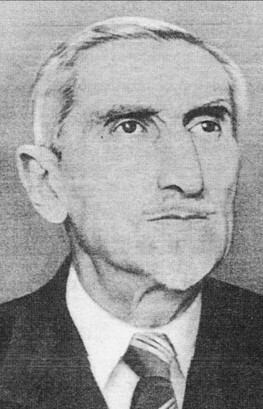 A. Trotter remained at the University of Padua until 1902, when he was entrusted to teach Plant Pathology at the School of Enology of Avellino, and, subsequently, at the Agronomy Faculty of Portici, Naples, where he worked until 1949 as full professor of Botany. Trotter's scientific career reflected his broad interest in Botany. Since his beginning at the University of Padua, he demonstrated a strong attitude towards the floristic, with a specific interest in mycology, but he was also committed to the study of horticultural species, particularly those from South Italia. On behalf of the Italian Government, from 1912 to 1924, Trotter participated in different expeditions in Libya  (Figure 2), mainly in Tripolitania [5–7]. The results of Trotter's work in this region and, to a lesser extent, in other Libyan territories was a collection of plant specimens and a repertorium of the drugs he bought in the markets of Tripolitania, together with an archive of information, field notes, and photographs. Some of his findings were published in two reports [8, 9], which are unavailable to the current scientific community. Over time, Trotter's materials were scattered throughout different rooms of the Botany Department and merged with other accessions belonging to different collections. The organization of the new museum offered the possibility of grouping Trotter's exhibits in one collection, which represents a unique source of ethnobotanical information, dating back to a century ago, on a scarcely known geographical area of North Africa. It has been stressed that there are only a few places in the world for which diachronic data for ethnopharmacological purposes are available . Recent efforts on this subject have been recently presented for Estonia  and Poland [12, 13], but old ethnobotanical data are very scarce for the African continent [14, 15]. A portrait of Alessandro Trotter. 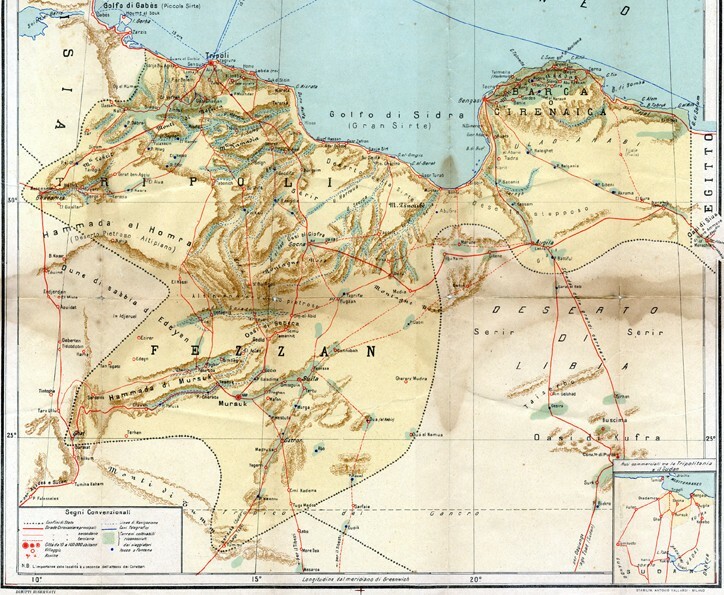 Geographical map of Libya in 1912 . The aim of this paper is to report the data on plants used in folk medicine of Tripolitania and neighboring regions collected by Trotter during his expeditions in Libya and to present a preliminary description of the exhibits now available in the Libyan ethnobotanical collection of the Orazio Comes Museum. North Tripolitania is dominated by the Jaffar Plain, which slopes downward to the west and upward to the highland territories (Jabel Nafusa), which in turn continue eastward with a belt of hills around Tarhuna and Homa . The vegetation is dominated by steppes, which cover a zone extending from the coast west of Zamiya to a large part of Jaffara Plain, the Jabal Nafusa, and eastward to the Misurata region . The soils around Tripoli, extending to central Jaffara, are rich in organic compounds, but the soils are poor and sandy in the rest of North Tripolitania and rocky in Jabal Nafusa. In coastal Tripolitania and in the Jabal Nafusa highlands, the climate is Mediterranean, with long, dry and hot summers, whereas in central and eastern Jaffara and in inland Jabal, the climate is semi arid, and drought occurs frequently . At the beginning of 20th century, agriculture was concentrated in the oasis of the coastal territories and in part of the Jabal Nafusa plain. In the rest of the region, pastoralism (sheep, goats and camels) was the most common land use, together with transhumant cereal cultivation. The areas of mixed cereal cultivation and pastoralism were held by seminomadic groups through a combination of private and collective tenure . After his first expedition to Libya (1912), Trotter assembled a collection of plants primarily from North Tripolitania. In the subsequent trips, he gathered specimens from other regions of Libya as well [5–7]. The Trotter Collection, now located in the Orazio Comes Museum, features herbarium samples, drugs, historical photographs, and manuscripts. The Libyan Fanerogamic collection currently includes over 2300 sheets of mounted and accessioned plants. The herbarium is organized alphabetically by family, and each herbarium sheet measures 43 × 28 centimeters (Figure 3). Paper specimen labels are attached to the right corner of the herbarium sheet. 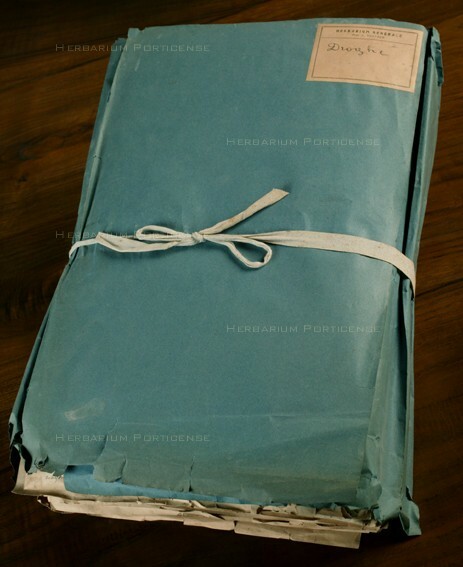 Loose parts or fragments of plant organs are included in envelopes attached to the herbarium sheet. Each voucher specimen was annotated by Trotter with the current taxonomic name at the time, the Libyan location from which the specimen was acquired, and the collection date. Additionally, Trotter added ethnobotanical information for about 80 species, which have now been grouped in a specifically designed archive. 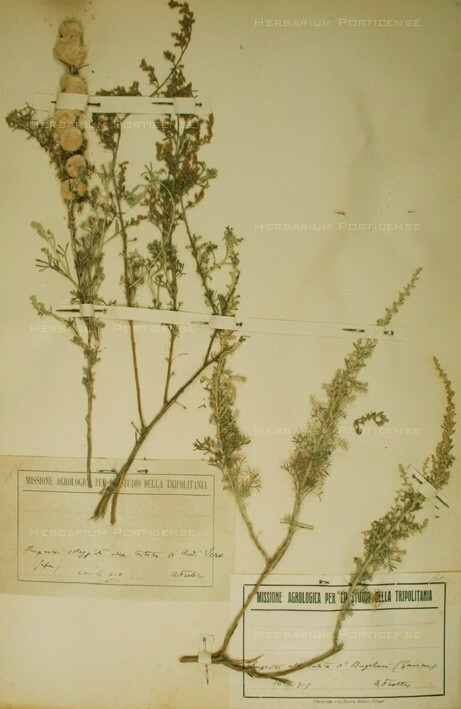 Herbarium specimen from Trotter collection, Artemisia herba-alba Asso. 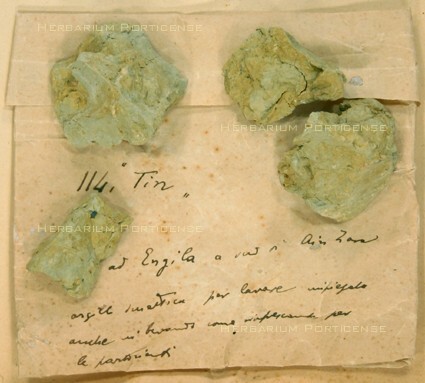 The drugs (Figure 4), prevalently acquired by Trotter from Tripolitania markets, were identified and packed by Trotter in 83 paper sheets or boxes (Figure 5), which were stored in a wooden cupboard (Figure 6). Included in the collection were some unidentified drugs, corresponding to n. 74 and 83. Paper sheets and boxes containing the drugs. 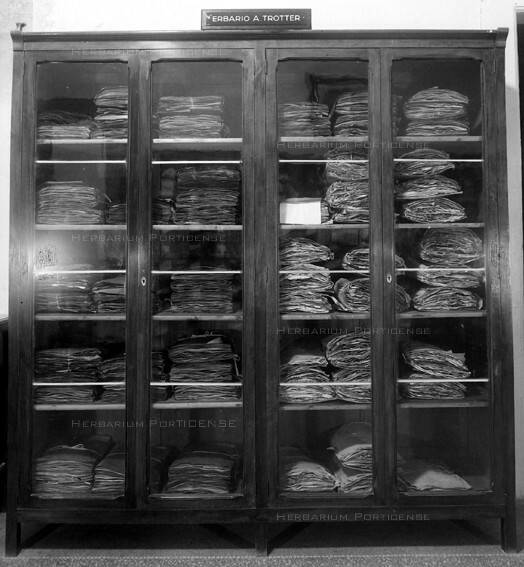 The original wooden cabinet of Trotter Herbarium. Recently, a database of the herbarium species and drugs has been carried out, and, subsequently, a taxonomic update has been attempted. The nomenclature has been revised according to the African flowering plants database  and the World Checklist of selected plant families . Italian colonization of Tripolitania began in 1911 without a preliminary assessment of the land: for this reason, geographical expeditions in Libyan territories were undertaken between 1912 and 1916, with the participation of various specialists. The first expedition  had the task of carrying out mineralogical and agronomic studies on Tripolitania, and Trotter was the agronomist of the expedition. During his residence in Libya, he studied the flora (algae, fungi, and higher plants, including cultivated species) of Tripolitania. He was also greatly involved in the collection of information on plant uses from the local people. This interest was driven by practical needs, as plants used by Libyans could have potential economic benefits to emigrant settlers. In this paper, we have concentrated our attention on the medicinal uses of Libyan plants collected by Trotter. In Table 1[21–45], these ethnopharmacological data are compared with the recent available information from Libya and other neighboring countries. Plants used in Libyan folk therapy at the beginning of XXth Century according to Trotter data. North African Countries. The tubercles are used to cure a wide range of affections  In Sudan, a tuber decoction is used to treat stomach troubles and as an anthelmintic . Stem galls mixed with leaves of Lawsonia inermis are powdered, kneaded with water and applied as a hair tonic . In North African countries, branch and leaf decoctions are prepared to cure intermittent fevers, arthritis and rheumatisms and used as a depurative, diuretic, hypoglycemiant and laxative [23, 25]. The decoction of the aerial parts is administered against constipation, fever, and mycosis . The plant is sold in the Algiers and Rabat markets for use against diarrhea, gastro-intestinal disorders, asthma and other respiratory ailments. It is also topically applied for painful organs. The plant is also used in perfumery and cosmetics [23, 25]. Leaves and buds are used against hemorrhoids and skin affections. Fruits are administered for the cure of ocular disorders. An infusion of the leaves is used as a mouthwash against gingivitis and in association with walnut and mulberry in the treatment of diabetes . The seed decoction is used as a local analgesic and antirheumatic . In Tassili N'ajjer (Algeria), the decoction of seeds or the aerial part of the plant can be drunk as an abortive and to cure diabetes. Externally, used to treat rheumatism and various pains . The fruits are used to make an alcoholic beverage to which is attributed medicinal properties. The leaf decoction is administered against intestinal parasites and rheumatism in Central Sahara  as well as an emmenagogue, spasmolytic against gastro-intestinal and liver disorders, diuretic, carminative and sedative in Morocco . A leaf infusion is also prepared against tachycardia and as a cholagogue and vasopressor. Leaves are also externally applied against wrinkles, muscular pains and rheumatism and as a vulnerary . Used in North Africa against dysmenorrhea . The occurrence of? after a local name of a plant is a Trotter indication. 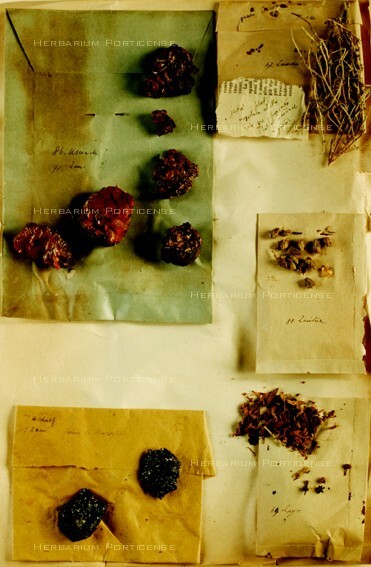 Trotter collected his ethnobotanical data mainly during the first expedition (1912). The provenance of the information is not always indicated, but we are far from the present standards of ethnobotanical investigations. Frequently, a single or very few informants are the source of the data, and, in some cases, Trotter reported only that the plant was used as a medicine, without describing the therapeutic applications. Notwithstanding these limitations, a not-irrelevant body of knowledge was assembled. Data are related to about 70 species of flowering plants and to 4 lichens. The plants are mainly from Mediterranean or Sub-Saharan habitats, with a slight prevalence for the former. The plants belong to 37 different families; Lamiaceae was the most cited family with 10 accessions, followed by Asteraceae with 9. The prevalence of these families has been reported in the conclusive report of the Rubia project on medicinal plants in Mediterranean area . The authors suggest that this could be because the plants belonging to these families are easily recognizable by the morphology of the flowers and due to their aromas and flavors. Generally, the aerial parts of the plants are the most frequently used (28 species), followed by leaves (15 species), flowers and seeds (9 species), fruits (7 species) and hypogean organs (roots, rhizomes, tubers: 5 species). Plants were generally processed in very simple ways: an infusion or decoction of the plants were prepared and orally administered or used for topical applications. A wide range of affections was treated, ranging from mental disorders to skin affections. All the organs of human body were considered, but the pathologies of the gastro-intestinal tract, respiratory system and those related to traumatic accidents (contusions, swellings, burnings, wounds) were the most frequently mentioned. Trotter described a decoction, named sciba, made with three different lichens belonging to the genera Evernia and Ramalina. The species mentioned are found worldwide and largely used for dyeing , but the species are also used in perfumery  and in traditional medicine of numerous countries, due to the presence of active compounds, as usnic acid and atranorin . Trotter did not indicate the therapeutic applications for this decoction. With a similar name, al-sheba, the lichen Parmotrema tinctorium is sold as food spice in India . As far we know, there are no other reports dealing with this preparation in the Maghreb countries. Overall, 75 plants (including the four lichens previously mentioned) were also collected as drugs by Trotter; 30 of these had medicinal properties. 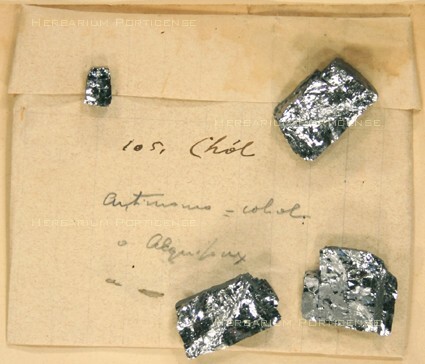 Two mineral samples (antimony and clay) were also held in the drug collection (Figure 7 and 8); they were used in topical wound treatment by numerous ancient and primitive societies . The drugs were mainly sold in the Tripoli market, but also in local markets spread along Tripolitania. Libya is located in the middle of Mediterranean and was an important crossroad for trade in ancient times. The Libyan towns established commercial relationships with countries of all three continents, Africa, Asia and Europe. The town of Cyrene was a prime center for the export of the medicinal herb called silphium, one of the essential commodities of the Mediterranean region in classical era . A late echo of the ancient flourishing trades was still present in the drugs found by Trotter at the beginning of the 20th century. He collected drugs that are, to a large extent, of Mediterranean origin, and are currently traded in Mediterranean region. Drugs from herbs such as Ajuga iva or Artemisia arborescens or those belonging to the genera of Lamiaceae, listed in Table 1, are commonly found in the markets along the Mediterranean, from Moroccan bazaars  to the herbal shops of Turkey  and Greece . In contrast, some drugs were of Asiatic provenance, such as Alpinia officinarum  and Piper retrofractum , whereas others, such as Tanacethum parthenium, came mainly from Europe , suggesting that the ancient trade routes from Asia and Europe to North Africa were still being used a century ago. Few drugs were produced from indigenous plants; perhaps the most interesting case is that of Ferula marmarica, a plant native to some Libyan regions , which was used in classical times to produce the ammoniac gum , to which Dioscorides attributed relevant therapeutic roles ranging from anti-inflammatory to digestive and painkiller . Antimonium (PORUN - TTD76), Tripolitania Trotter collection Drug section. Clay (PORUN - TTD77), Tripolitania Trotter collection Drug section. The Trotter Collection can represent a useful tool for current ethnopharmacological research in Libya and neighboring countries. It is known that about 80% of the African population presently rely on traditional forms of health care, but it is not easy to document continuity and changes in therapeutic approaches. The information collected by Trotter contributes to filling this gap, enabling us to trace the use of plant utilization in Libyan folk medicine over the last century. A comparison with the recent ethnopharmacological research in Maghreb reveals a high correspondence; almost all of the plants cited by Trotter are still used in the folk medicine of at least one of the North African countries, and therapeutic uses of each plant appear consistent over that time. The results of this study, although based on information that needs to be confirmed by current methodologies, seem to suggest that it is possible to find a core of a shared popular medicine along the African Coast of the Mediterranean Sea, probably due to climatic, cultural and linguistic continuity. The authors contributed equally to this paper. All authors read and approved the final manuscript.